Jeffery and Sylvia are training, supporting, and encouraging national leaders to evangelize and disciple believers, especially youth. They also host short-term mission teams who want to serve the indigenous people groups. They’re currently helping to build a church in San Martin Peras. 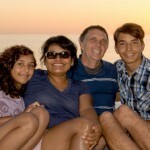 You can donate to the Simons’ ministry in Oaxaca here. In the indigenous communities where we work, we baptized over 20 people last year. The most ever! The gospel is spreading in our municipality of 20,000+ people spread out in 40 villages. The Lord also provided funding for us to help hundreds of people with basic food packages and water 4 days after the earthquake last year and 60 families with roofing and cement in November and December.